The African clawed frog’s ancestor inherited one set of chromosomes each from two different species and doubled its whole genome some 18 million years ago, according to an international research consortium led by Japanese and American scientists who sequenced the entire genome of the Xenopus laevis for the first time. Scientists hope that the finding will help our understanding of vertebrate evolution, as the vertebrate genome doubled twice 500 million years ago. 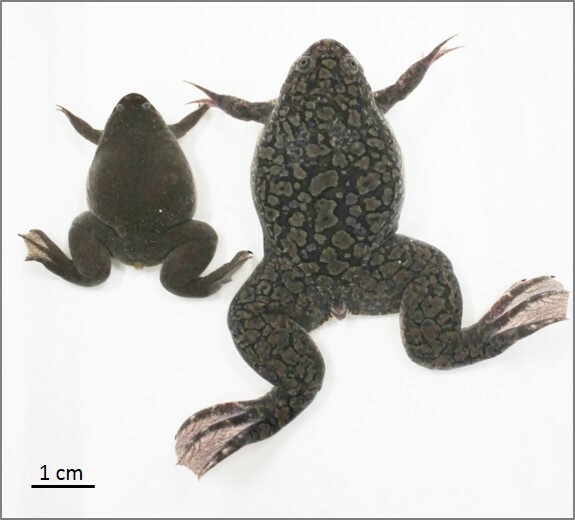 Caption: Though similar in appearance, the tetraploid Xenopus laevis adult female is noticeably larger than its counterpart in the related diploid species Xenopus tropicalis. “I thought that analyzing the ‘transposable elements’ (segments of DNA that move around the genome) that become fixed or inactive over time, might be one way of tracing the two ancestral genomes, present as subgenomes in X. laevis,” says Taira. He suggested this idea to his co-authors, Dr. Akira Hikosaka at Hiroshima University and Dr. Yoshinobu Uno at Nagoya University. They tested Taira’s idea and discovered that indeed two sets of chromosomes originated from different diploid ancestors. 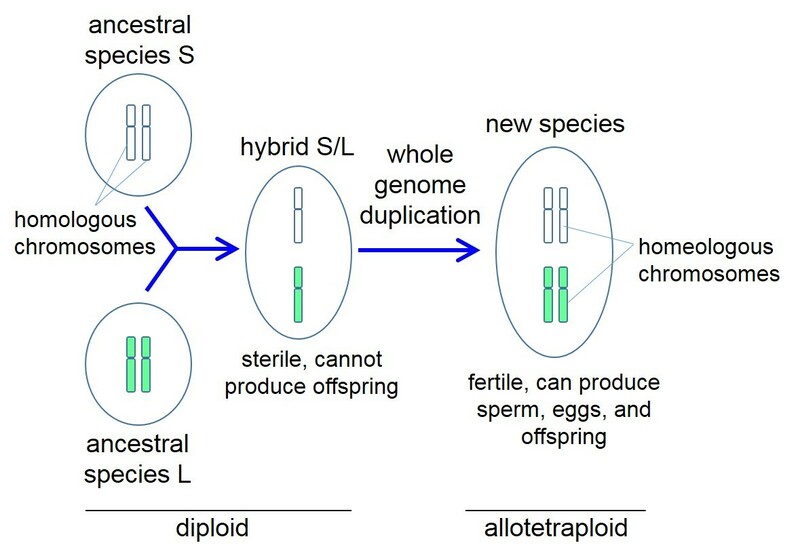 Caption: Two ancestral species with nine pairs of chromosomes, S and L, mate to produce a hybrid S/L offspring with 18 chromosomes that do not pair. This sterile offspring undergoes whole genome duplication to produce a new fertile species with 18 pairs of chromosomes that is ancestral to all Xenopus species. For clarity, the process is rendered here with only one type of chromosome. Caption: “Fossil” DNA sequences found only in the S subgenome (chromosomes) of Xenopus laevis emit a red glow employing the FISH method. 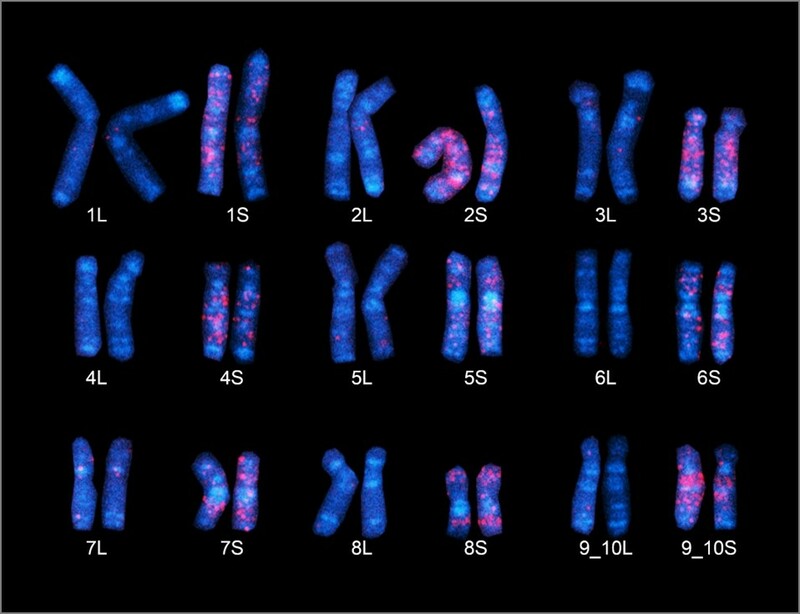 The nine S chromosomes here clearly possess a larger number of red regions, believed to have derived from ancestral species S. (Chromosome 9, at bottom right, is represented as “9_10,” as it corresponds to the fusion of ancestral chromosomes corresponding to chromosomes 9 and 10 in Xenopus tropicalis). “Scientists believe that two rounds of whole genome duplication 500 million years ago contributed to the emergence of the first vertebrate species and an explosion of diversity in this group. We think our discovery will improve our understanding of this important event in our evolutionary history,” says Taira. Adam M. Session, Yoshinobu Uno, Taejoon Kwon, et al.